Email marketing increases retention, converts better than social and search, and makes you money! Email marketing is a growing industry and it’s growing for one reason, because it works. This is a run through of some of the reasons why you really should be doing email marketing. 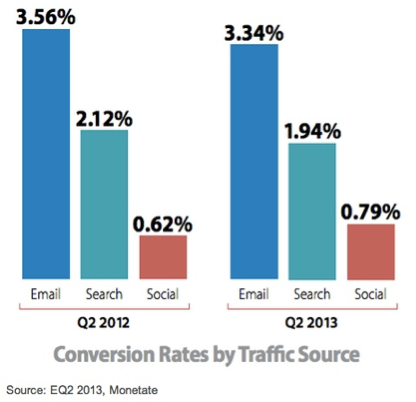 There’s no getting away from it, email marketing can achieve better conversion rates than any other channel. If you properly build and maintain your list it can be an incredibly powerful sales tool. If you’re not doing email marketing right now, this alone should be enough to convince you. In other words, if you use email effectively to foster and maintain relationships the lifetime value of a customer will increase. This can have a massive impact on your bottom line especially if you are struggling with a high customer acquisition cost. Reason 3 - It makes money! The bottom line is the bottom line and this is it. Email makes money (if you do it properly). Just setting up a campaign and letting it run isn’t going to cut it. You need to invest the time to properly understand your audience, this will help determine how you engage and activate them through email in order to be profitable. That’s right, you’ve got access to 95% of your audience through email. The thing is you have to get them to sign up through your list and opt-in to email marketing. Once you do that the 95% drops dramatically. The key here is to make your email marketing something that appeals to them. Exclusive content and competitions will help to encourage people to sign up to your list. This is one of the main reasons why email is much more powerful than other channels. It’s why it converts better and why people are happy to receive advertising which they actually engage with. They have opted in - asked to receive that messaging. If you make sure that messaging continues to be interesting and engaging then people will continue to be happy to receive it. Email has a low barrier to entry and as long as you follow the basics it’s also got a very low risk. Of course being a savvy marketer will result in better campaigns and better results. However creating marketing campaigns with a healthy return on investment can be done by a novice with a little time and research. If you’re not doing email marketing right now there are a myriad of tools, most of which have free plans. So you can sign up and start sending emails without needing to spend anything except your time. Make sure you choose a client which has an easy to use sign up form, you will find most will create one with an embed code which can be very easily added to a page or even just by using a WordPress widget. Email is growing, it’s getting bigger and bigger. Even though people are moving increasingly to IM and Social for personal messaging the market itself is still growing. An investment now in email marketing is one that will pay dividends especially if you adapt as your audience, and the way they use email, changes. We spend a massive amount of time on email, we check it religiously. Email is a far more reliable channel to communicate with customers than any other form of mass communication. Social moves fast, so fast in fact that if you’re audience doesn’t see your content within a relatively small timeframe it’s more than likely they won’t see it at all. Compare that with email where the lifespan is often until whoever it’s targeted at decides to deal with it. Be that by deleting or opening it. Are you spending 40 times the effort on email than you are on social for customer acquisition? So that’s it, 10 great reasons to make email marketing a priority. It’s not going anywhere and it’s a massive potential channel you could be missing out on. What’s more it’s very cheap to implement. Remember though, email should be about engagement. Don’t just spam your audience with offers. If you enjoyed this you'll probably want to know how to create a successful email newsletter.